Around foundations and under trees, you can often have spots of dry shade, where there's just not enough water to reliably share. Few plants thrive in dry shade, so a ground cover that can fill out lots of space and handle drought is like a trump card. 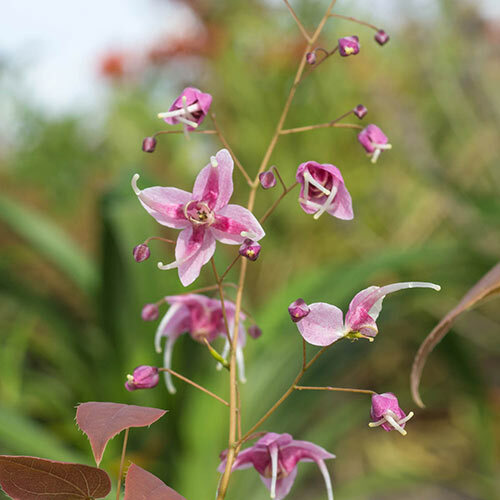 Epimedium is a plant like that, it stays low and spreads out with plenty of leaves to cover the area. It's also easy-care, deer resistant and long lasting, so it makes a nice time-saving solution to this problem. This variety of epimedium not only covers ground, but keeps it interesting with gorgeous raspberry mottling on its foliage. And in spring, you'll get sweet little blooms over top, which attract butterflies and other pollinators that contribute to a healthy garden. Because it's such a striking feature, it can also bring a nice color contrast to containers, and since it's tough and drought tolerant, it makes a nice rock garden feature. Soil RequirementsPrefer good loamy soil. Drought tolerant once established. 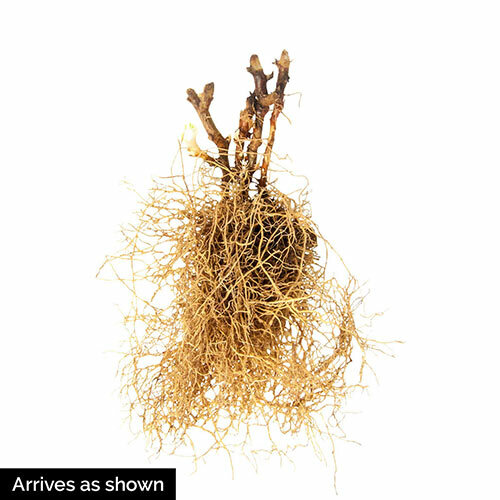 PruningOld leaves should be pruned to the ground in late winter. Can be divided in early spring or late summer.